In Part 3 of this series I provided excerpts from the book, When Money Dies, which chronicles the hyperinflation of 1920's Wiemar Germany, and I explained that common potatoes were worth gold when paper money became worthless. Those who lived in the country and knew how to produce food on their land got through the hyperinflationary years with relatively little trouble. This essay of my "hyperinflationary series" is about the importance of owning some actual gold and/or silver in the event of a hyperinflationary event. In An Agrarian-Style Economic Self Defense Plan (published back in 2008, before the mini-economic-crash in the fall of that year) I suggested that it would be wise to do 6 things to be prepared for a significant economic disaster. But nowhere in that essay did I mention the acquisition of precious metals. I left the acquisition of gold and silver out of that advice because I felt there are six things more important than having a stock of gold and silver. And if you seriously pursue the six things I suggest, you will be in a position to acquire any gold and silver you might need in the crisis, by means of food trading, from others who did not do those six things. Unfortunately, very few urban or suburban people in this country are going to make any agrarian lifestyle changes and sacrifices now, to be better prepared for economic and social crisis later. Based on the historical record, it is safe to say that when paper dollars, and investments in paper-dollar assets are rapidly losing their value (on their way to total worthlessness) only tangible assets will have value. To my way of thinking, a section of good land in the country is the most valuable tangible asset any person or family can own—regardless of what the economy does or doesn't do. But, though you can harvest many necessities of life from the land, good rural land is not something that is easily exchanged for other, lesser, necessities of life. So, other tangible assets will have value and be used as a more common medium of exchange in place of paper money—things like a sack of potatoes, or a chicken (or chicken eggs), or a bar of soap, or a piece of stovepipe will be "money." In short, anything someone else needs or wants that you can trade to get something you need or want. In other words, when paper money fails, the economy will keep chugging along, but it becomes a person-to-person barter economy. It is also probable that gold and silver will be universally utilized as money to purchase needed goods and services. This was the case in Wiemar Germany. In every other hyperinflationary period in history (of which there have been many) gold and silver have served as a reliable medium of exchange. Some people assert that gold and silver are true-money, and that these metals never totally lose value, as eventually happens with all paper-money schemes. That sounds about right to me. With that in mind, I'd like to return to the case of Anna Eisenmenger, the Austrian widow who I mentioned in Part 3 of this series. You will recall that she lost her comfortable fortune in the hyperinflation, along with many others. It is well worth noting that as early as 1918 (years before the hyperinflation came) ... "[H]er bank manager advised her earnestly to convert all her money into Swiss francs. However, private dealings in foreign currencies were illegal, and she decided that to break the law against hoarding of food and fuel was enough." Swiss francs were a stable, gold-backed currency, unaffected by inflation and hyperinflation. Had Anna Eisenmenger done as her banker earnestly advised, she would have retained her wealth. I think there are always people who see and understand better than most others when trouble is brewing, and that unconventional measures are prudent. Anna Eisenmenger's banker was, evidently, one of those people. It so happens that there were a number of German citizens of wealthy means who did convert their wealth to gold or stable currencies, or converted it into investments that were outside of the German mark. These people were able to weather the economic destruction that came, perhaps as well as the self-reliant rural people. Beyond that, they were able to purchase valuable assets at bargain-basement prices from the less fortunate German citizenry. In other words, some of them profited from the economic downfall of Germany. Bearing that in mind, there are a number of books being published these days that have titles like, "How to Profit From the Coming Economic Crash." I've never read one of those books, and I never will. But I suspect that a key part of the profiting methodology is to invest in precious metals. Then, when the economy crashes, and people need money for the essentials of life, and gold is worth really big money, you can go buy valuable stuff real cheap. Personally, I have no interest in profiting from the misfortune of others, especially those in my community. Nevertheless, I do have some silver in the form of pre-1964 American coins, which I look at as "poor man's bullion." I don't consider this motley assortment of "junk silver" to be an investment, as much as a store of value that can not be destroyed by inflation. If there is a downside to owning pre-1964, 90% silver American coins, I don't know what it is. In a hyperinflationary period, the coins may pay my property taxes or emergency medical services. If hyperinflation never comes, the coins can be easily sold (something I've had to do on a couple of occasions), or they can be easily divided and handed down to one's heirs. If you have gold or silver jewelry, or sterling silver, it will hold value. When Money Dies tells of a woman who kept herself fed by selling a single link at a time off her gold crucifix chain. Probably the best place to buy small amounts of "junk" silver coins is on Ebay. 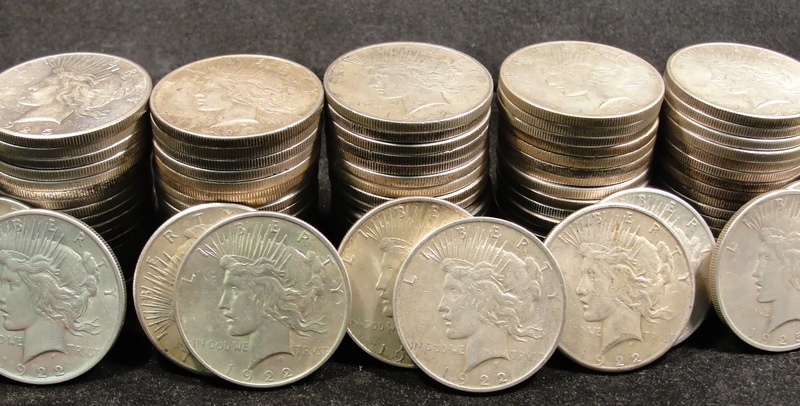 A roll of 5o Mercury dimes is now selling for around $100. You can get pre-1964 Roosevelt dimes for even less. You can get "Peace" silver dollars (coined from 1921 to 1935) for around $25. Those prices are currently considered cheap (the price of silver is low). I've seen them much higher in the past. As for converting money into other currencies, as Anna Eisenmenger's banker advised her to do, I don't think there is currently a safe currency in the world today. Someone can correct me if I'm wrong on that. Even the Swiss franc is no longer backed by gold. Most world currencies are "pegged" to the American dollar, which, as previously noted, is no longer considered a safe investment by many people in the world. In fact, world demand for physical gold and silver is spiking in countries like China and India. They may see the writing on the wall better than most Americans. That, for what it's worth, is my take on precious metals and hyperinflation. It is the perspective of a simple-minded man who, frankly, does not have much in the way of sophisticated financial expertise, or financial resources. But, by the grace of God, I do have a section of debt-free land out in the country, and I know that all true wealth originates from the land. If you have a section of land with some woods, a source of good water, some appropriate tools, and some know-how, you can generate wealth in the form of food, fuel, water and shelter. These are among the most valuable assets in life, hyperinflation or not. I agree with all that you said in this update, but think you might have forgotten a couple of additional "precious metals". Maybe I've been reading too much Jim Rawles, but copper jacketed lead may also be a good investment. Ballistic wampum, as he likes to say, may be a good bartering currency - .22lr bricks are small, won't go bad (assuming you store them properly), and are easily divisible. Assuming you'll ever be able to buy 22lr again. Thanks Herrick - terrific post as usual. In response to your query about currencies - the Swiss Franc is currently pegged to the Euro. I would suggest that most currencies are not pegged to the US Dollar. There are some that are, but most trade as a cross rate. If they were pegged they would move in together, not in opposition. Certainly, the US Dollar is the "safe haven" currency (and I use that term in its official trading capacity - NOT to suggest that it is, in fact, a safe haven) and thus it is essentially the global benchmark; but that is not to suggest that currencies are pegged to its value. Finding a stable currency is definitely a challenge if not impossible. I prefer tangibles. While I like silver, you can't eat it, wash with it, or take it for an ailment. Shelf-stable tangible items may prove to be far more valuable. In the case of hyperinflation, how would you go about paying your property taxes with silver? Does the tax department recognize a silver dime for its silver value, or would it be considered as ten cents? Also, how would you pay the doctor? They all seem to be part of a "medical corporation" these days. I also agree that ammunition appropriate for hunting for food is a good idea. Herrick, you are an agrarian gold miner, digging up wonderful nuggets of golden agrarian wisdom and sharing them with all. Thank you. It seems to me that silver would need to be converted to cash to pay taxes. It is easily converted now and I would suppose it will be easily converted later. Perhaps the same would apply to medical corporations. But when cash is worthless I have a feeling that any service provider is going to consider other options. Everything changes when the money is destroyed. I grew tobacco one year. Little seeds. Big, impressive plant. But I don't smoke. It was just a fun thing to grow. Maybe. But I haven't figured it out yet. many folks land could be stolen, evn though it has been paid in full. So a bit of PM might not be a bad idea.